It’s that time again, folks. The weather is getting crisper, houses are being outlined with flashing lights, and we here at Hardmode are gearing up for another marathon! The YWCA is the oldest and largest multicultural women’s organization in the world. Our mission is to eliminate racism and empower women. We provide safe places for women and girls, build strong women leaders, and advocate for women’s rights and civil rights in Congress. There are nearly 300 YWCA associations nationwide at over 1,300 sites serving almost 2 million members and participants. YWCA associations are divided by regions nationwide. This enables our associations to pool resources, provide additional services for their clients and combine their voices for change at the national and local levels. We are thoroughly excited to be helping out this great organization! Now to the nitty-gritty: The show begins in less than one week on Friday, December 3rd at 8:00pm CST, so mark your calendars. 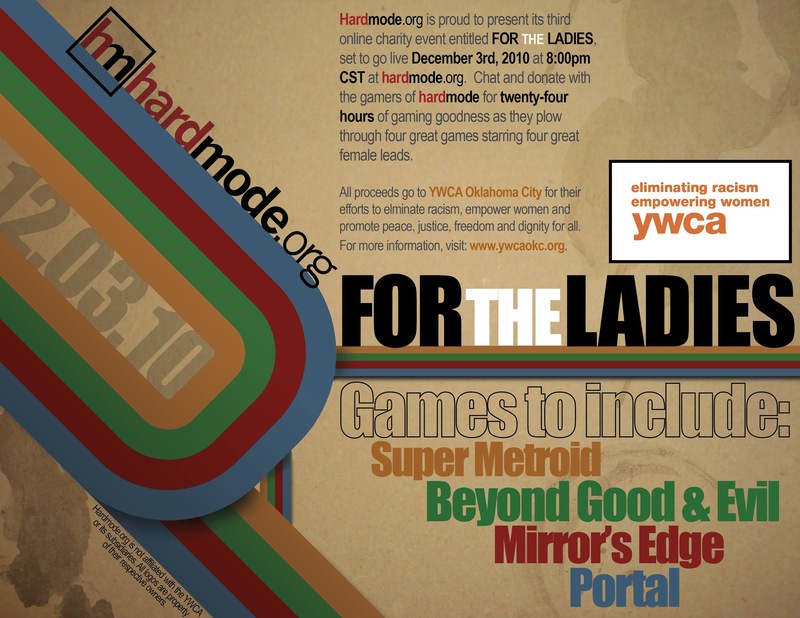 Because the YWCA has a great focus in the support of women, the games we will be playing all have female leads. On deck are Super Metroid, Beyond Good & Evil, Mirror’s Edge, and Portal. With our past two events, we have used a service called Chip-in, allowing anyone to donate quickly and easily right on the site. This time, however, we are going to try out a new service we might have talked about before called Crowdrise. Donors will have to go to the site to help out the YWCA, but Crowdrise offers some really great incentives (like the possibility of winning a laptop or a $500 gift card). We will definitely have a link to our fundraising page on our homepage during the event, but if you want to check it out now, head over here. And that’s the skinny. We look forward to seeing you all next week!